Beets are as popular in Hawaii as anywhere else, but the difference is that we can get them year-round because of our tropical weather. They are so beautiful and really good for you. Beets are considered a superfood because of its health benefits. Beets not only lower blood pressure by helping improve blood flow, but increase a person's stamina and energy. They're packed with fiber, vitamins A, B & C, magnesium, and iron. Including beetroot in your diet can protect you from many things like hypertension, possibly Alzheimer’s, cholesterol and even dementia. Pregnant women are encouraged to include beetroots in their diet as it is a rich source of folate and iron. Beets have shown to reduce the risk of heart disease. 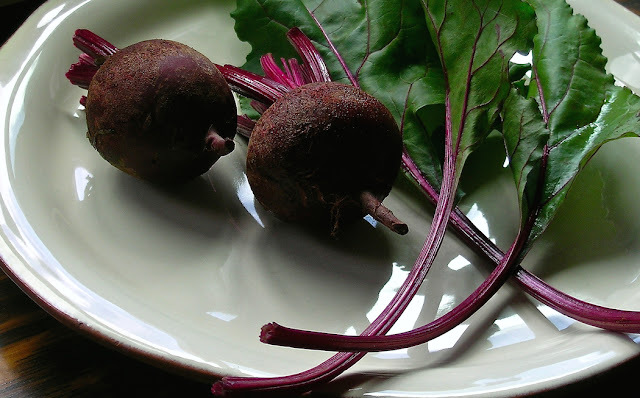 As beets are rich in sugar, they can even act as a high-energy snack. Beet’s richness in beta carotene helps combat anemia, especially for people who do not eat meat. 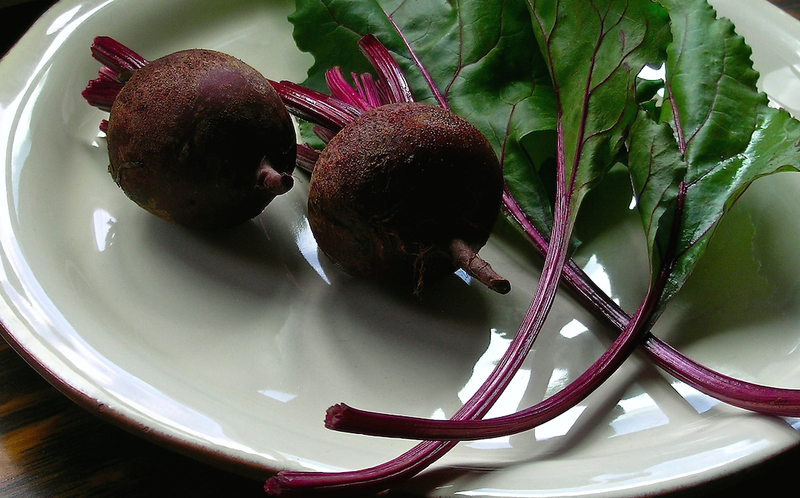 Beets’ color pigment has also shown signs of fighting cancer cells. In research studies, beets have also shown to fight stomach cancer cells. It contains fiber and iron and lots of antioxidants. So if you are vegetarian you should include some amount beetroot in your diet. If you are a diabetic patient, check out this site. Beet tops are also good for you. 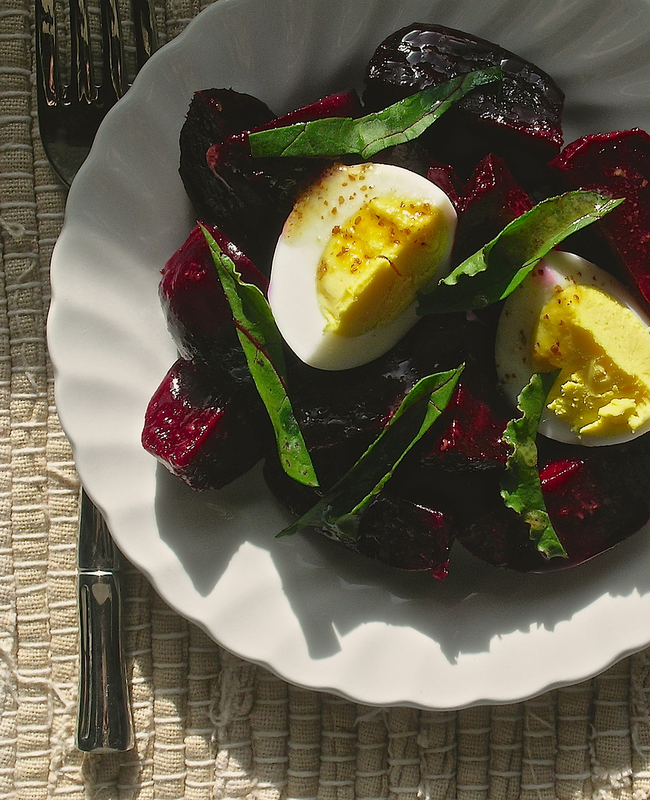 The greens of beets are very high in lutein and zeaxanthin which are good for eye health. They are a great source of Vitamin A and Vitamin K. They also have natural fiber which helps keep you full longer, and help with digestive health. For more information about beets, check out this great site, or for a delicious recipe for Beet Green & Mushroom Frittata, click here. Heat the oven to 375˚F. Lay a large sheet of aluminum foil on a baking sheet. Scrub the trimmed beets and lay them on one end of the foil. Sprinkle with 1 tablespoon of oil and season with salt. Fold the foil over the beets to make a packet and roll the edges to seal. Bake until the beets are tender, about 30 minutes. Let sit on the baking sheet until warm but not hot. While the beets are still warm, peel them by pressing against the sides of the beets with your thumb, which loosens the skins, slice each beetroot into 4 wedges. Add the wedges to a serving bowl as you go. Whisk together the mustard, minced garlic, vinegar and a pinch of salt and pepper. Gradually whisk in the remaining 3 tablespoons of oil, until the dressing is emulsified. Pour the dressing over the beets. Sprinkle in the thinly sliced beet leaves. Season generously with pepper. Toss well, then taste and adjust seasoning. Let sit for at least 20 minutes before serving with chopped or sliced hard cooked egg. For more beet recipes, click here. If you want 7 recipes for beetroot juice click here! Pasta-Chicken Salad Minus the Mayo!